Even if it’s only for a few minutes, take the time to talk with your teenager each and every day. It could be over breakfast, or while sitting around the dinner table, or even while giving them a ride to the mall. Just make sure that you ask them how they’re doing, how they’re feeling, and what’s new in their world. 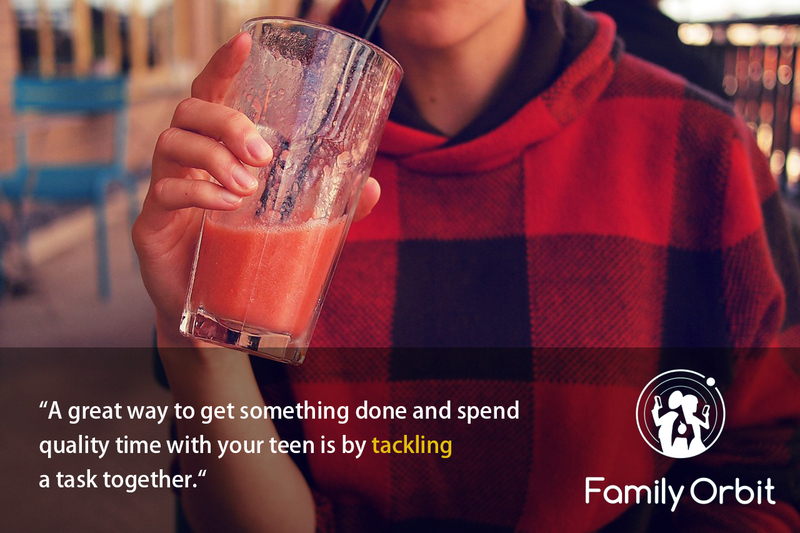 A great way to get something done and spend quality time with your teen is by tackling a task together. It could be as simple as unloading the dishwasher after dinner, or as complex as cleaning out the garage on a Saturday afternoon. It will give you the chance to spend time talking and accomplishing something as a team. Every parent knows how difficult it can be to get a teenager to do things that they don’t want to do, but nagging your child will only make it worse. You may have asked them to take the trash out or wash that sink full of dishes, but they just aren’t doing it. Yes, it can be frustrating, but give them the chance to make things right. Try to take a step back before you start to nag, and try a different approach. Offer your teen encouragement, rather than a punishment or harsh consequences for not doing what you expect them to do. While video games or hip hop music may not be interesting to you, they could hot topics for your teen. Show a genuine interest in the things that they are interested in, and ask them about it. Let them tell you what they love about their hobbies and interests, and ask them questions. You just may be surprised at what you’ll find out, and they’ll likely be surprised that you took the time to ask. Many times, teenagers are going through things in their personal lives that they feel like their parents simply cannot relate to. They may be surprised to find out that you have actually gone through similar situations and experiences when you were young. Share those personal stories with them, and let them ask questions. They may start to see you in a new light, and come to realize that you actually have more in common than they previously thought. Remember, it’s tough to be a teenager, especially in today’s world. Kids face many challenges, and they need the love, encouragement, and support of their parents. Be there for your teen, and make those important connections whenever you can.